Are Wheel Spacers and Adapters Safe? Drive with confidence knowing that quality and customer satisfaction go hand and hand as our top priority when we sell and build anything. 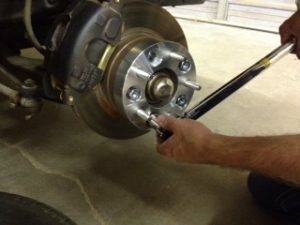 As long as the shop you buy from is reputable and uses top quality material; Wheel Spacers and Adapters are completely safe when installed correctly with care and patience. Proper installation is paramount to ensuring the safety of your vehicle. We include installation instructions on our site, as well as with every custom set we ship out. These instructions enable the most novice of mechanic or DIYer to safely install their wheel adapters / wheel spacers no matter the origin. Quality means everything in any major purchase. While you may not consider a simple wheel adapter to be a major purchase, the fact is, lower quality means lower safety. Don’t skimp on price and end up with unsafe low quality adapters. We encourage all of our customers to research the companies that they are considering purchasing from and the quality of their products. Quality is a huge deal when it comes to the parts you add to your car. You’ll want to look for materials made from aircraft-grade aluminum. This ensures strength and safety as well as a high resistance to corrosion. When you find a reputable shop, you’ll find that they use 6061-T6 aluminum adapters. If the shop you’re buying from can’t confidently say that it uses metal fit for an aircraft, you should probably find the nearest exit. Purchasing your products from an assembly line could potentially save you money, but what does it mean in the long run? Spending money on mass produced casted products is different than buying custom parts. Custom parts machined by small businesses and are individually made and designed to meet your specifications. Small businesses have the capability to understand what you have, what you need, and how to get you what you’re looking for. Don’t overlook small businesses that can custom-design around your needs in favor of cheaper products that may actually cost you more money and damage in the end. This attention to quality and detail are what make wheel spacers and adapters safe. When you’re shopping for wheel adapters, make sure that the shop you’re buying from can meet your needs. Obviously, there’s a difference between a Chevy and a Volkswagen, and there’s a difference between a three-wheeler and a four-wheeler. While the wheels may appear similar (or identical) at first glance, the reality is that they’re all unique, and the adapters that are meant for your vehicle are equally as special. Keep in mind the purpose of your purchase. If you’re in the market for adapters that you will eventually attach to a large truck, you won’t be safe if you cut corners with a product that’s not meant for your purpose. Large trucks are intended for a much larger haul, so cutting costs with the incorrect adapters will end in very disappointing results. Are wheel adapters safe? — as long as you take the appropriate safety precautions. Avoid buying cheap products because you may ultimately pay much more in the long run. Authentic shops that are able to customize to your needs can provide products made with genuine quality and help you avoid mass-produced messes. Have some more questions? Contact US Wheel Adapters, and let us help you get on your way!